Welcome to this blog. I hope to use this site as a place in which to think and write about the place and significance of the image in everyday life. Sometimes that will mean writing about an actual image – such as an artwork, or a piece of graffiti, or a movie – and sometimes it will mean simply reflecting on how images work on us, on the purchase that images have in contemporary life. I’m a university academic, and I teach and write about images. I teach one subject which deals primarily with film, particularly films that focus upon violence, crime, law and justice. At the moment, I’m writing a book about that, and much of the ideas for that book have come from the experience of teaching this topic over the last 12 years. The book is called Visions of Violence: Cinema, Crime, Affect, and it is two thirds completed. No doubt there are going to be some posts arising out of the process of finishing the book over the next 6 months. I also teach a course, also focusing on violence, which engages with images as well as textual representations: post-Holocaust art, for example, or photo-documentation, or comic books. And for years I’ve been fascinated by the intersections and interconnections of law and the image. I wrote a book a few years ago called Judging the Image: Art, Value, Law – it looked at the encounter between law and image and tried to imagine it as a relation of co-implication, rather than the collision or struggle it is so often conceived as. When I was writing that book, I became very interested in trying to write about the experience of spectatorship: that is, trying to say what it is like to look at an artwork. That’s definitely something that I would like to pursue here: to think about spectatorship of images, to call attention to the looking that gets done in the quotidien spaces of the everyday. Part of that is going to be about the phenomenon of subjectivity in the city. I’m also writing about street art – artworks that appear in the urban spaces of cities such as London, Melbourne, New York, Sao Paulo. Looking at such artworks often occurs in the most mundane and yet exciting ways: walking past a wall on the way to work, or turning a corner to take a shortcut and suddenly coming across a painting on a peeling concrete wall. So this blog is intended as a space for the recounting of sites of spectatorship. It was my partner Peter who had the idea of blogging about this: I owe him thanks! It feels like a new relationship – a new way of thinking and writing, and I’m excited to see where it will go. And to mark this inaugural post, I’m including what I consider to be one of the most beautiful street artworks I’ve seen in a long time. 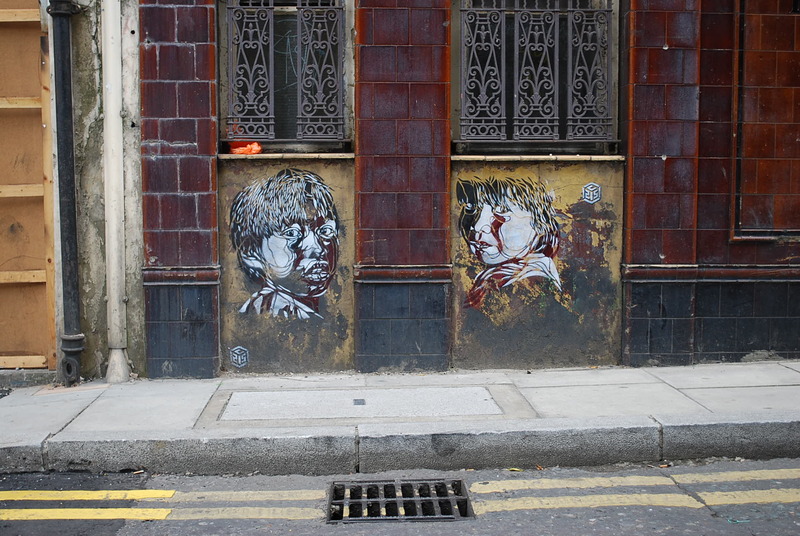 This is by the French artist C215, and I took this photograph in Shoreditch, London, in July 2008. Great blog. God bless her. And all who sail in her.